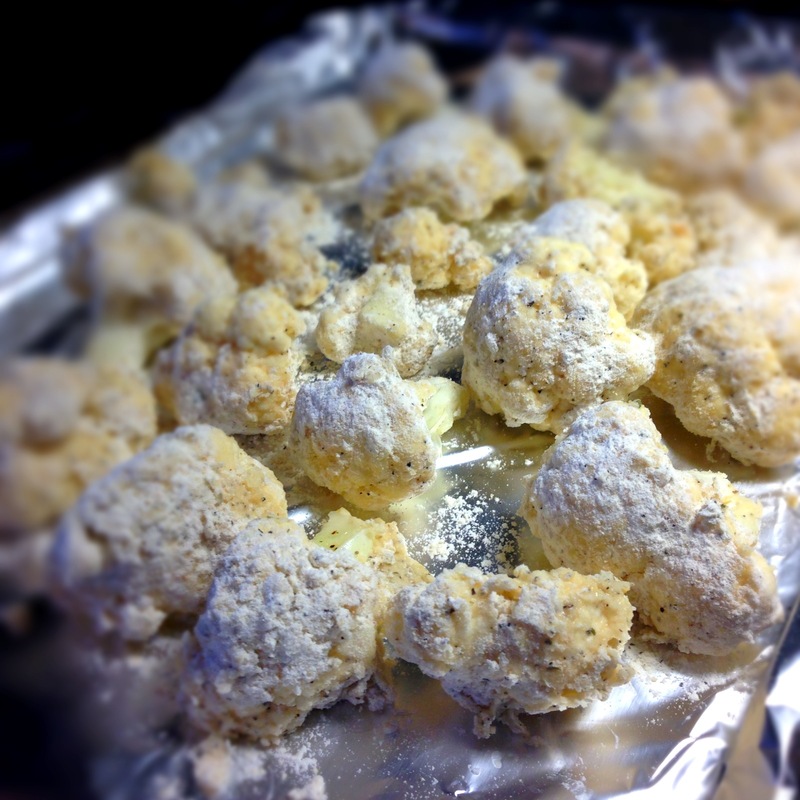 Boil the cauliflower & potatoes (if using) until soft. Drain & set aside. Heat a TBS or so of vegan butter (or other oil) and saute mushrooms & onion until both are browned & soft. Set aside. Melt a TBS or so of vegan butter (or other oil) and saute the leek until soft. Set aside. Saute the faux meats together until heated all the way through (primarily to cook the Beyond Sausage & drain some grease). 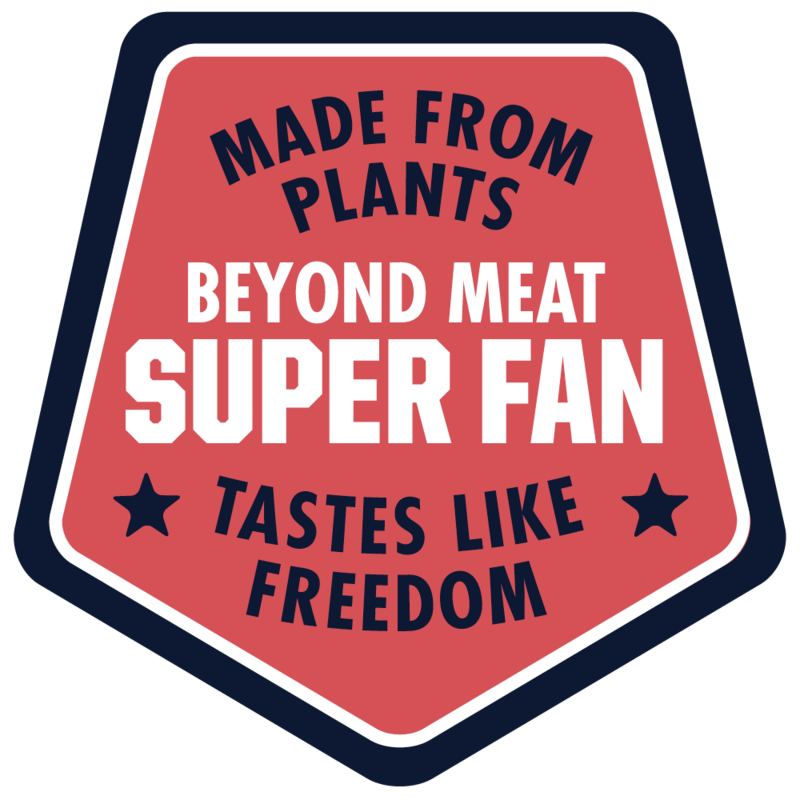 If you are using other meats than Beyond sausage – there is no reason to precook them. Mix the faux meat with the mushrooms & onion. Mash the cauliflower & potato mix with the leeks & about 1/4 cup of vegan milk & 2 TBS or more of vegan butter. Season with S&P. Assemble the shepherd’s pie by putting the faux meat mix on the bottom of a casserole pan (I divided mine between two smaller pans (see above). Top with whatever veggies you are using & then top with the mashed cauliflower. Bake for about 30 minutes or until heated through. Serve! I plated mine as double-decker stacks so it looked prettier & more substantial. Photo from The Iron You. The photo just above is from the wonderful blog – The Iron You. It is their Eggplant Parm Rice Casserole and it is that recipe that inspired mine here. There are a few subtle changes but the primary difference is that I used cauliflower rice rather than real rice and I made it vegan. 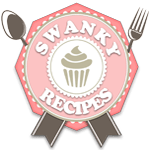 That way – this dish is very light & nearly guiltless. Is is very easy to make & comes together in less than 45-60 minutes – 30 of which are in the oven. It is a surprisingly tasty recipe & chock full of fresh vegetables. If you have a grill or grill pan, spray some olive oil on the eggplant (or toss them in a light coating of olive oil or dressing) & grill on each side until a bit charred & soft. Set aside. If you do not have a grill or grill pan – follow Iron You’s oven method directions: Preheat oven to 400°F and place a rack in the middle. Line two baking sheets with parchment paper and grease them with vegetable oil. Set aside. Fill a large bowl with cold water, add 1 teaspoon of salt and stir until it dissolves completely. Add eggplant slices and let them sit for at least 20 minutes to draw out the bitterness. Fish the eggplant slices out of the water, pat them dry, and arrange them on a single layer on prepared baking sheets. Bake in the oven for about 15 minutes, or until the slices turn deep brown on top. Remove the slices from the baking sheets and carefully transfer them on a plate to cool. Reduce oven temperature to 350 degrees. Cut the florets from the cauliflower & either grate them on a box grater or using the grater of your food processor (the FAR neater way to go). Set aside. Toss the tomatoes with basil, a pinch or S&P & the oregano & crushed red pepper & set aside. Heat a TBS or so of olive oil in a large frying pan (large enough to hold all the cauliflower rice) & saute the shallots or onion until soft. Add the cauliflower rice & the stock. Over high heat – saute until the cauliflower is soft & the bulk of the stock has evaporated. Stir in the tomato & basil mix and the sauce. Grease a casserole pan (I used cooking spray) and layer 1/3 of the rice on the bottom. Top with half the eggplant and 1/3 of the cheese and 1/2 the sausage. Add another 1/3 of the rice, remaining eggplant and 1/3 of the cheese & the remaining sausage. Top with a final layer of rice & cheese. Bake for 20-30 minutes or until the cheese is melted & the casserole is heated through. Let sit for 10 minutes & then serve with parsley or basil & maybe extra diced tomato. Hey! Have you heard? 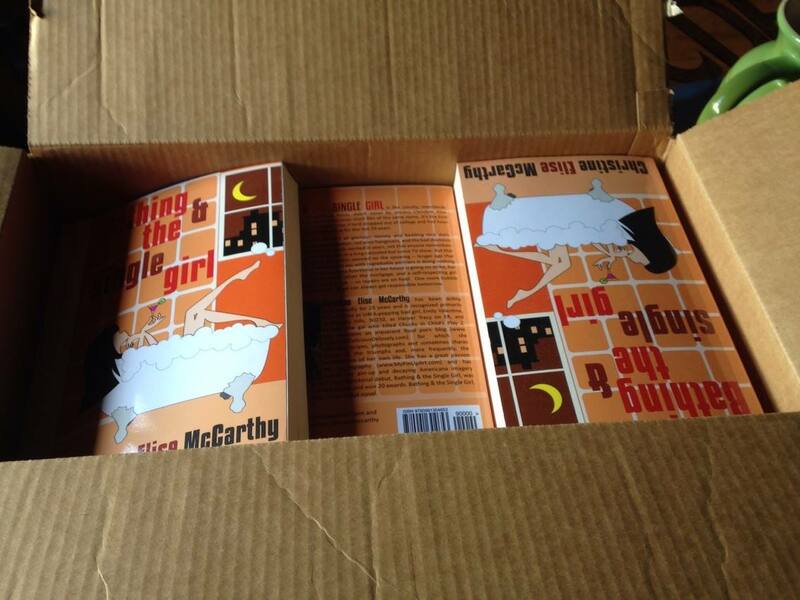 I wrote a really funny & dirty novel! www.BathingBook.com. Check out the reviews on Amazon! Why not buy a copy? This baby is pretty easy. 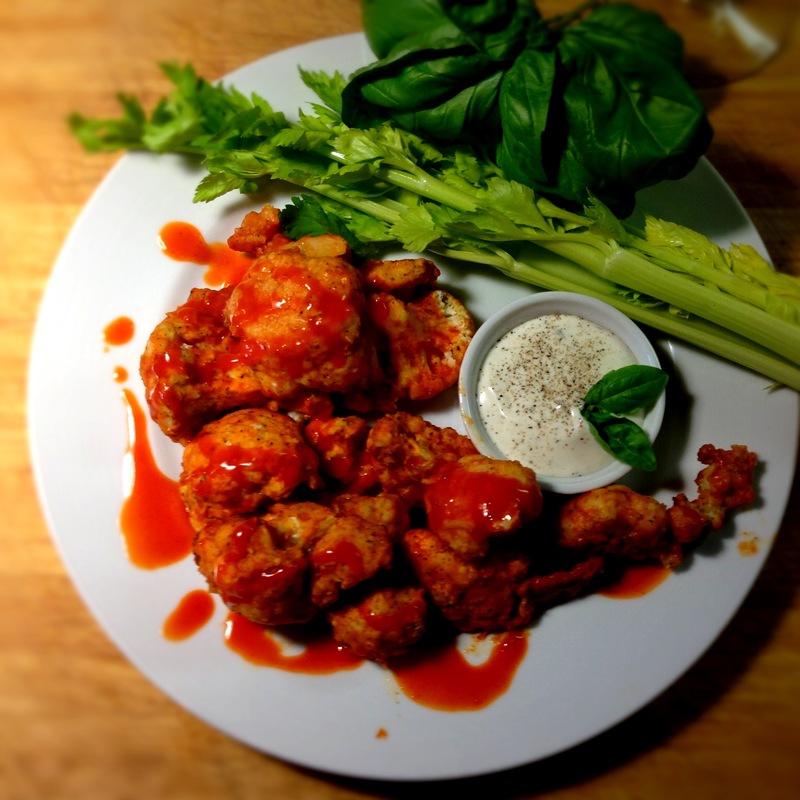 I love buffalo sauce but I do not eat chicken so I am always scouting for other ways to eat it – whether on pizza or with shrimp or to dip French fries in – anything. This recipe uses cauliflower & is virtually calorie-free. I used regular flour but gluten free flour or a chick pea (besan) flour – even panko or breadcrumbs could also work. Most recipes I’ve seen add an even amount of butter to the buffalo sauce but I see no reason to add that many calories. Pre-heat the oven to 425. Pour milk in a bowl & whisk in the flour with the spices. Melt the butter & whisk it into the buffalo sauce. Cut the cauliflower into florets. Dip each into the flour mix. Spray a cooking sheet with cooking oil. 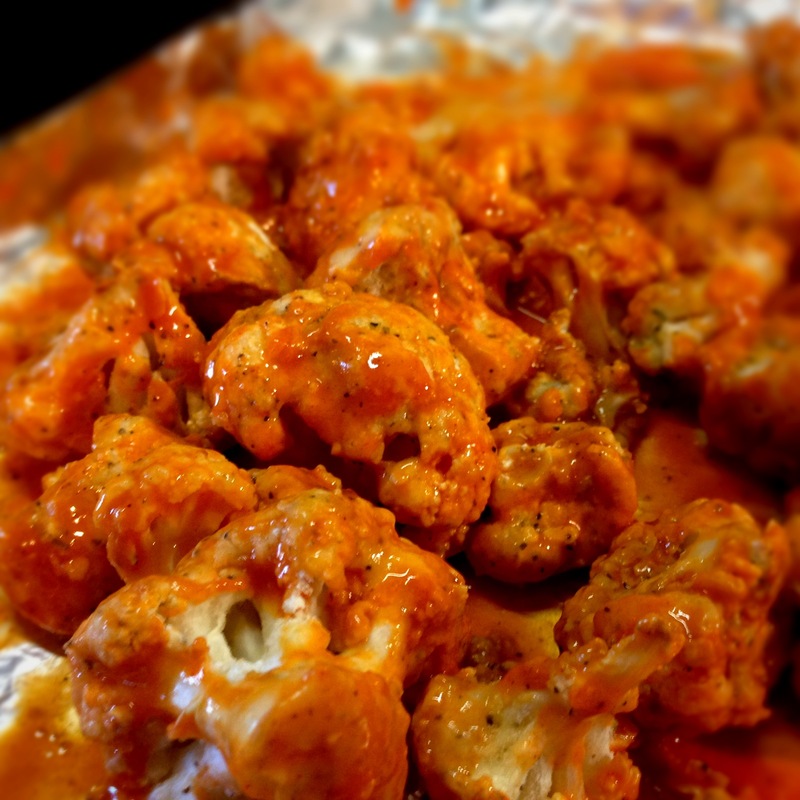 Place the cauliflower on the sheet – spoon about 1/2 of the buffalo sauce over the florets & toss – & bake at 425 for about 15 minutes. Take them out & coat them with remaining buffalo sauce & bake another 15 minutes. 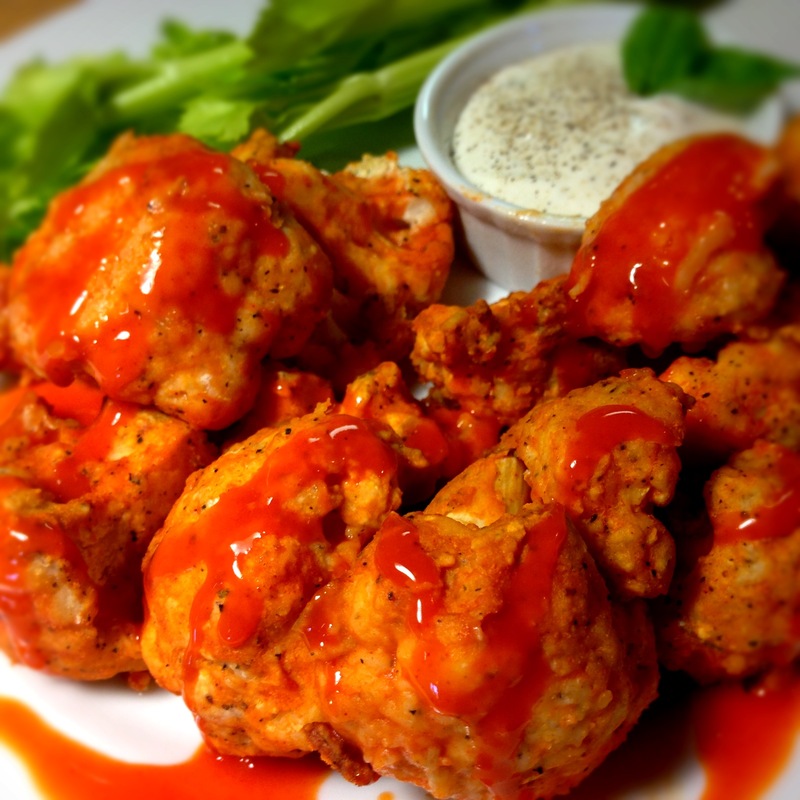 Put them on a plate & drizzle more buffalo sauce on them. Serve with celery & blue cheese (or Ranch) dressing.